Drafting is recognized as a growth field where job openings outpace qualified candidates to fill annual positions available. Currently, there are 216,000 drafters in the United States with about 12,000 drafters employed in Illinois. People entering drafting, after being properly educated, can look forward to starting salaries of $25,000, on average. In Illinois there are currently around 250 openings in this field. The CIP (Classification of Instructional Programs) code is 48.0105 for drafting and 15.0810 for CAD drafting. There are many different kinds of designers in the United States. Those designers classified by the U.S. Department of Labor that relate to the IDEA are industrial designers, interior designers, landscape designers, automotive designers, tool and die designers and exhibit designers. These professionals number nearly 125,000 nationally and about 5,000 in Illinois. It is important to note that not all designers and drafters are readily detected in government studies and statistics as so many are self-employed. Designers may be titled by work experience or educational attainment. Those who carry the title by educational attainment usually have a bachelors degree. This association, founded in 1957, is the only one of its kind in the nation. Faculty who run and participate in this organization do so without pay on a volunteer basis out of dedication to their students and a love for their occupational field. Illinois is rich in manufacturing and construction concerns that employ drafters and designers specializing in a wide variety of areas of expertise such as architecture, civil, electrical, map making, mechanical, piping, and welding, to name some of the most common. 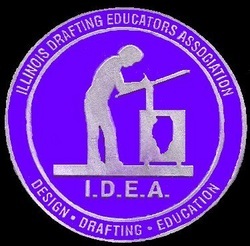 Most of these drafters were educated in their occupation by one, or more, of the nearly 500 drafting educators employed throughout Illinois in secondary and post-secondary institutions of education, both public and private.